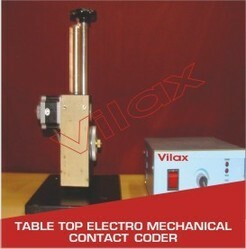 Vilax Electro Mechanical Contact Coder (EMCC) is suitable for all fully & automatic coding on products where coding is statutory means “NO CODE NO RUN”. It is a compact and ideal intermittent motion coder for making batch no., Date of Mfg., MRP. Date of Expiry & other statutory information on porous & non porous surface, it is Used for all intermittent Flow ‘On Line’ Automatic pouch packing machines. Vertical & Horizontal, FFA machines by the Help of photocell / Programmable logic Controller (PLC) With 6 digital counter having LCD displays. It has ten batch wise memories, which can be seen whenever required .Once Select Mode of operation i.e. manual / automatic etc. On LCD display, also Speed Of Pouches/min. Made from specially formulated imported material to release the right amount of Ink for each impression Easy to mount and long lasting in normal use-MOTOR : Hy droid type stepper motor. Ink transfer by flexo types Grooved / Flat stereos 3mm size or other required size. Grooved stereos are interlocking type & can be changed on demand. 5-10ml. Per-charge. Gives 10000 to 20000 impressions per charge depending on size of marking.